Retired US Congressman Paul G. Rogers, an early and ardent supporter of the NLM, died of lung cancer October 13 at Sibley Memorial Hospital in Washington, DC. Known as “Mr. Health” for his leading role in passing dozens of measures promoting health care and the environment, he served for 24 years as a member of the US House of Representatives from West Palm Beach, Florida, retiring in 1979. As chair of the Subcommittee on Health and the Environment, Rogers compiled an unmatchable record of groundbreaking health policy advances for all Americans, including the Clean Air Act; Migrant Health Act; Health Manpower Training Act; National Cancer Act; Heart, Lung and Blood Act; Emergency Medical Services Act: Community Health Centers Act; Medicare-Medicaid Anti-Fraud and Abuse Amendments; and the National Health Promotion and Disease Prevention Act. In 1968, Rogers was instrumental in establishing the Lister Hill National Center for Biomedical Communications. After leaving Congress, he became an advisor to Lindberg creating long-range planning initiatives in the mid-1980s. In 1989, he served on the Library’s Outreach Planning Panel, which issued an influential report on the importance of improving the dissemination of health information. 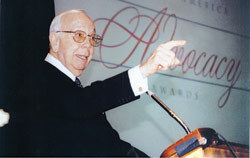 As a founder, in 1986, and chair of the nonprofit Friends of the National Library of Medicine (FNLM), he built a coalition of individuals, medical associations and societies, hospitals, health science libraries, corporations and foundations into an effective, productive supporter of the NLM. One of its most important achievements is NIH MedlinePlus the Magazine, the consumer quarterly published jointly with the National Institutes of Health, with editorial supervision by the NLM. The magazine is distributed to physician’s offices, hospitals, clinics, and libraries nationwide. Paul Rogers received the 2004 Distinguished Service Award from the NLM Board of Regents. He was chairman of Research!America, which established the Paul G. Rogers Society for Global Health Research to combat diseases that disproportionately affect the world’s poorest nations. A member of the National Osteoporosis Foundation, he received the National Academy of Science Public Welfare Medal, in 1982, and the Albert Lasker Award for Public Service, in 1993. Survivors include his wife of 46 years, Rebecca, of Washington, DC; a daughter, Rebecca Laing Sisto, of Westfield, NJ; a brother; and four grandchildren.